The calendar tells us that Christmas has passed for another year, but my family has one more gathering coming up in the next few days so I still need several more cards to share. 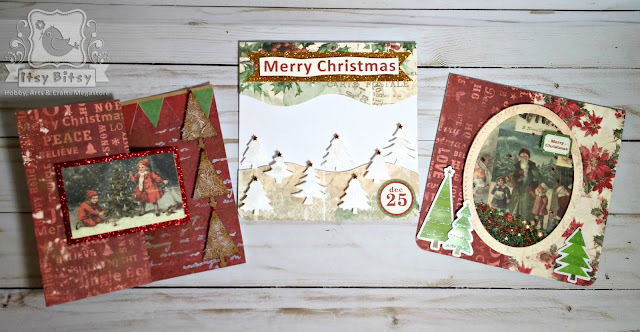 These 3 came together in a few hours time using the beautiful Joyful Rhapsody paper pack and lots of little Christmas embellishments from Itsy Bitsy for today's design team post. 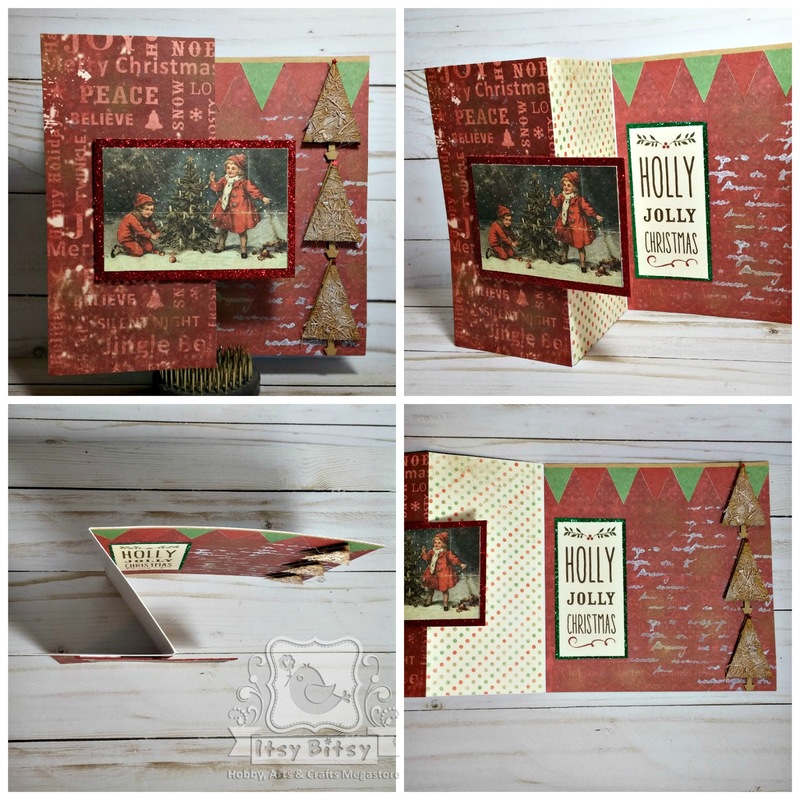 The first card in the trio is made with a simple Z-Fold design using a 6" x 6" white card base and 3 patterned papers . Using the Script Stencil #2 and white gesso I added some detail to the inside of the card and even sponged some on to the tree embellishments so that they would look frosty too. I then added tiny red star sequins from the Rubies and Sparkles Shaker sprinkles set to the tops of each tree with glue. I cut the vintage tree picture from the collage sheet and layered it on the red glitter paper from the paper pack. 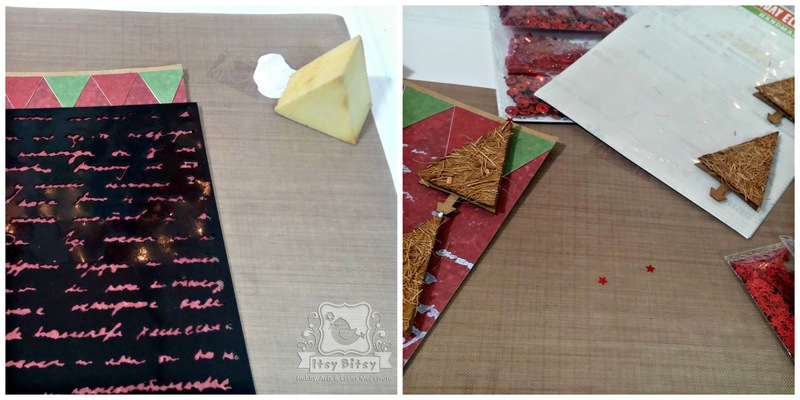 The pennant banner and sentiment were also cut from another sheet from the pack. 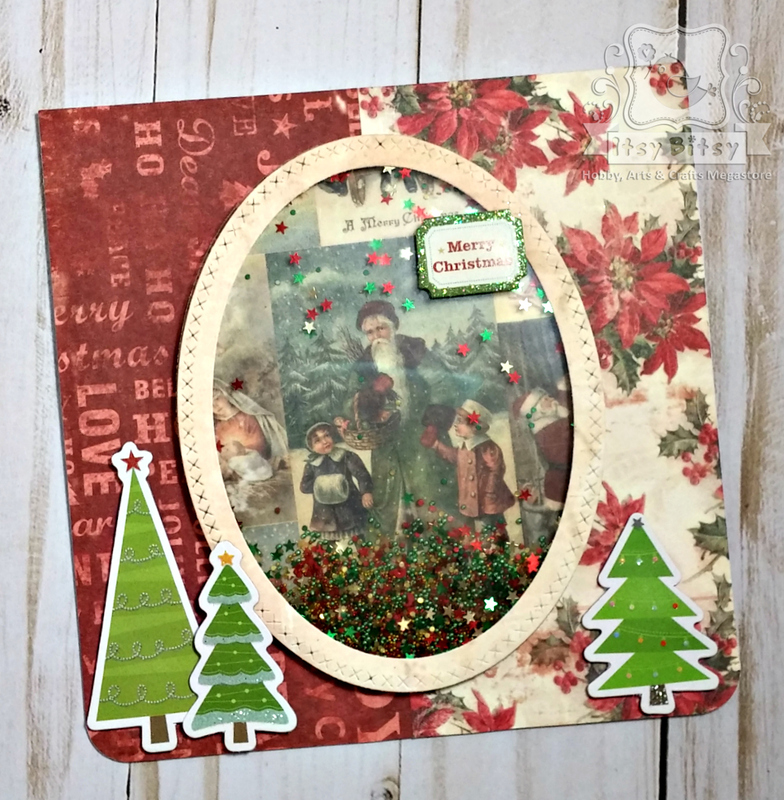 The sentiment is layered on to green glitter paper. 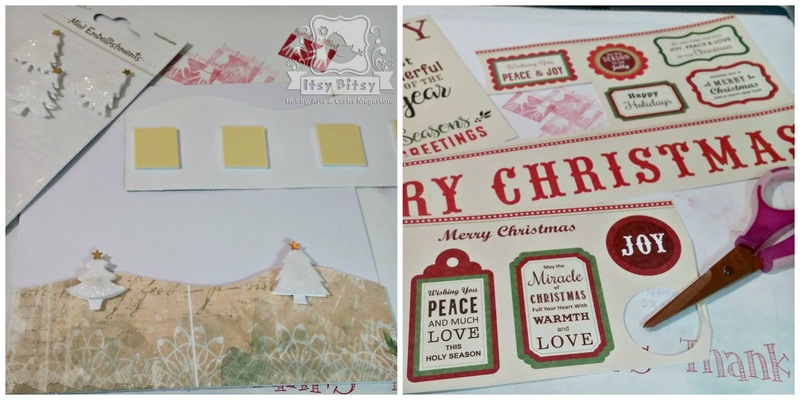 The second card is also made on a 6" x 6" white card base and the pattern paper was trimmed in a wavy line and layered on the top and bottom of the card using foam tape squares. 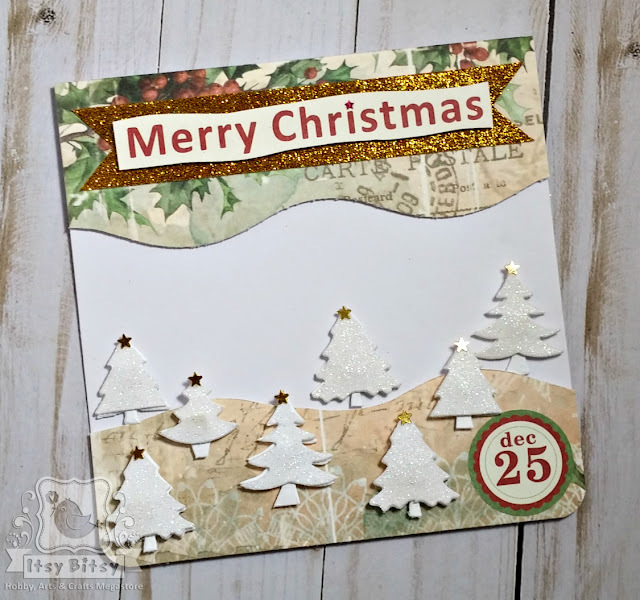 The white glitter tree embellishments were then added across the bottom while the sentiments were trimmed out and the larger one layered on the gold glitter paper and cut in a banner shape. The inside I used more of the patterned paper scraps left over from the card front and glued on a sentiment. For the third and last card, I made a shaker panel for the front. 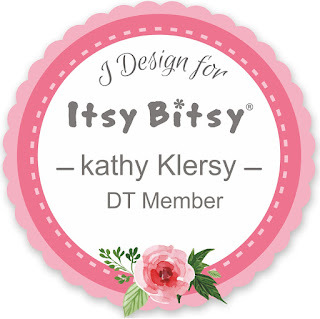 I covered the 6" x 6" white card base with 2 patterns from the pack and die cut the Cross Stitched Oval frames along with a piece of clear acetate for the shaker window. 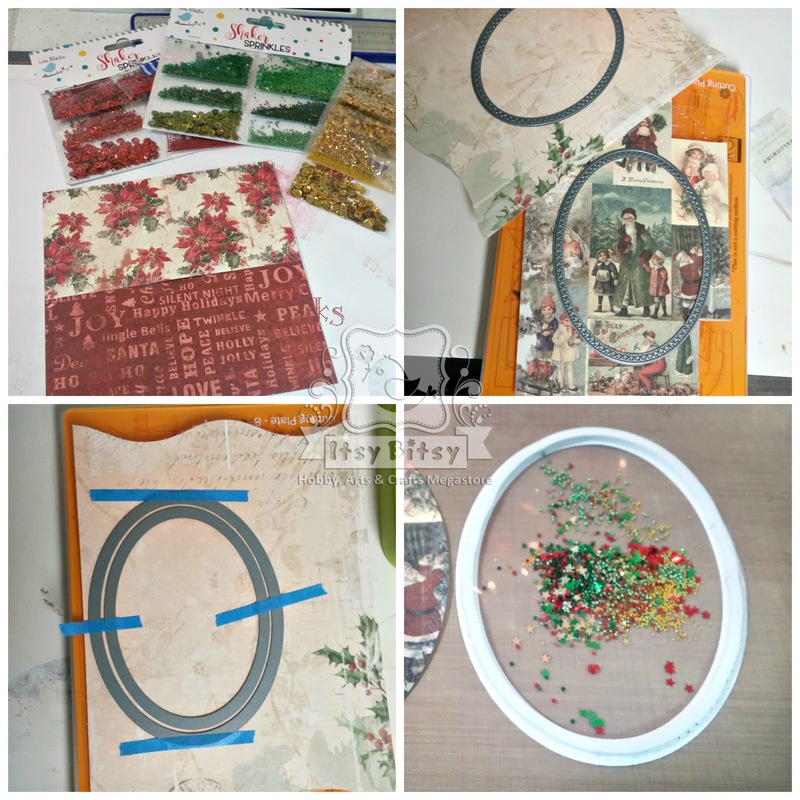 I then filled the window with green, red and gold elements from the Shaker Sprinkles packs. 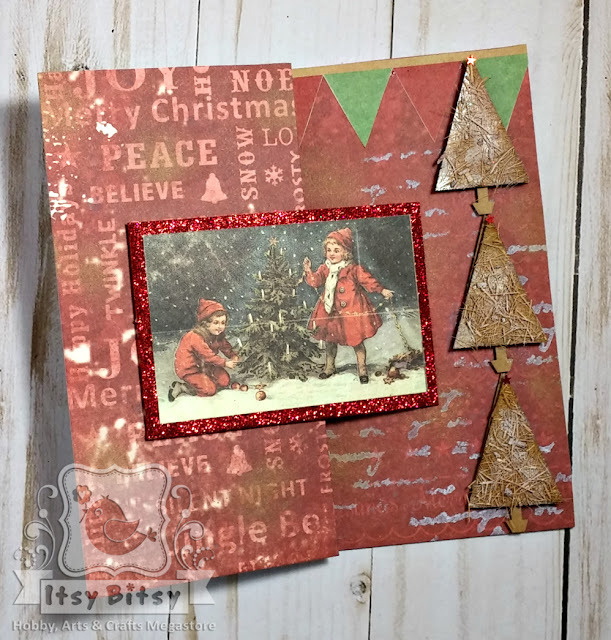 The vintage artwork on this card really lends it a classic look, while the Christmas tree pack embellishments lend a bit of a more modern flair. Inside the card I layered the left over oval diecut from the inside of the shaker frame with sentiments and borders cut from the sayings sheet.